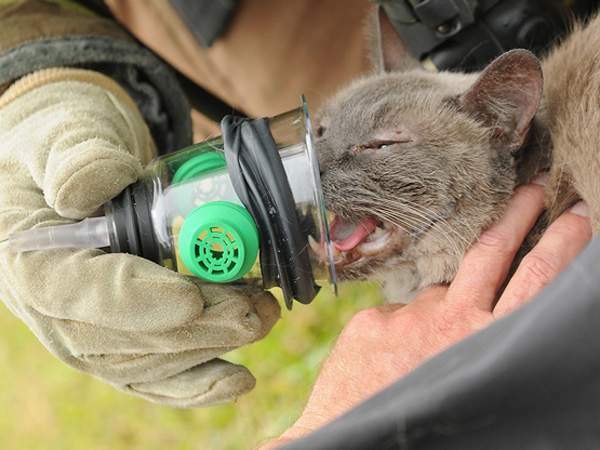 Wilmington firefighter Joe Lopez gives oxygen to Spice, an American Siamese cat, while Michael Storms with New Hanover EMS comforts the animal following a fire at Antiqua Apartments on Portofino Ct. Friday Sept. 18, 2009. Published: Friday, September 18, 2009 at 11:34 a.m.
Last Modified: Friday, September 18, 2009 at 2:12 p.m.
As smoke billowed out of a second-floor apartment Friday morning, Wilmington firefighters found a nearly lifeless victim inside. .Her name was Spice, an American Siamese cat, and things didn’t look good. She wasn’t breathing properly, clearly a result of smoke inhalation. No people were injured in the apartment fire that happened about 11 a.m. at Antiqua Apartments, near Carolina Beach Road and Independence Boulevard. A rabbit also was safely rescued from a ground-level apartment, and Spice was the only animal who had injuries. Capt. Ted Brown, of the Wilmington Fire Department, said an early investigation showed the fire starting in an exhaust fan in the ground-level unit, and smoke had filtered through the floor of the second-floor apartment unit where Spice lived. Time was running out if Spice was to be saved, so a paramedic and firefighter on scene did what they were trained to do on any patient. First, they laid Spice down on a grassy area and pulled out a type of oxygen mask that has been used before on dogs. Then, because Spice didn’t like the mask on her face, they positioned it in front of her while gently petting her. Spice started taking in the air as if she were licking it. Still, progress was slow, and she struggled at first to take breaths. Joe Lopez, a firefighter for the Wilmington Fire Department, held the oxygen apparatus in front of Spice for nearly an hour, petting her and monitoring her progress. Michael Storms, a paramedic for New Hanover Regional Emergency Medical Services, assisted. Both said they’ve never helped a cat before. Duke Bernard, who owns Spice and lives in the apartment directly above the ground unit where the exhaust fan caught fire, rushed home from working at the fleet department for the city of Wilmington and came to Spice’s side. He helped Lopez and Storms give Spice oxygen and talked to her as she made progress. Finally, after almost an hour had passed, Spice showed signs of improvement and began breathing on her own. Bernard took her in his arms and carried her, thankful she was going to recover. He said he plans to take her to a veterinarian for a full-check up.